Bígí linn! Ticéid ar fail ó bhaill an choiste £10 an duine. Ghlac baill de Chuann Gaelach Leath Chathail pairt sa mhórshiúl i mBéal Feirste le déanaí in agóid ag an easpa tacaíocht atá an dá stat, thuaidh agus theas, ag léiriú don Ghaeilge agus na deacrachtaí a bhíonn ann seirbhísí a fháil trí mheán na Gaeilge. 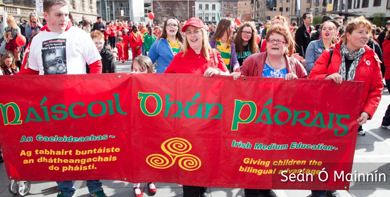 Members of Cumann Gaelach Leath Chathail took part in the recent march in Belfast protesting at the lack of state support for the Irish language, north and south, and at the difficulty there is in getting services through the medium of Irish. Beidh scólaireachtaí ar fáil do dhaoine fásta ó Chu- mann Gaelach leath Chathail le freastail ar curs Gaeilge de chuid Chomhaltas Uladh i Ros Goill le linn mí Iúil. Má tá éinne ar lorg ceann déan teagmháil leis an Chumann. Ní mór do’éinne a iar- rann scoláireacht bheith ag freastal ar ranganna an Chumann nó ina bhall. Beidh an rince seit i gclubtheach Cumann an Ruiséalaigh Dé Máirt 13 Bealtaine 2014 agus an t- airgead le dul chuig an Eiteoip. Bíinn rince seit san RGU gach oíche Mháirt. Oscailt Oifigiúil agus Seó sorcais le Stephen McGinely, léirithe ó páistí an cheantair. Páinéal cainte ar scannánaíocht – Eithne Ní Néill (Iníon S. Uí Néill) – Bríd Falconer (NI Screen) agus – Gearr-scannan le Ruairí Mac Riocaird. Painéal cainte ar chúrsaí aistriúcháin agus litríoch – Jacqueline de Brún (an tÁisaonad) – JJ Ó Dochartaigh (Ceolteoir) agus – Aodhán Ó Raghailligh (scríbhneoir). 8.00in An Solas Dearg léirithe ag Aisteoirí Ghaoth Dobhair i nDún Éigse. Beidh aistriúchán comhuaineach ar fáil i rith na féile. Irish language feature film (1977). Feature film produced in Irish, now digitally remastured. Bronnadh na bhfáinní ina dhiaidh Bígí linn! The set dancing in the RGU Clubhouse on Tuesday 13 May 2014 in aid of Ethiopia. Set dancing is held in the clubhouse every Tuesday. 3.15pm: Official Opening and Circus Show by Stephen McGinely and performances by local children. – A short Film by Ruairí Mc Crickard. 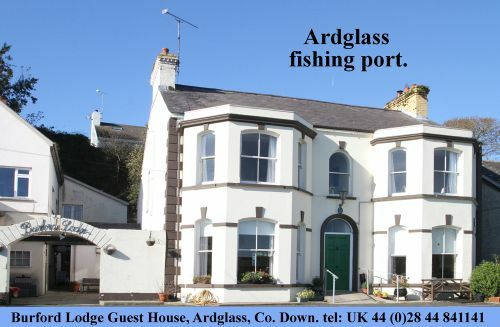 8.00pm An Solas Dearg presented by Aisteoirí Ghaoth Dobhair (The Gweedore acting society) in the Lodge.